I am currently learning reverse engineering and am studying the flags register. I had in my mind that rflags was just another name for one of the 16 general purpose registers, for example rax or rbx. But it looks like rflags is actually an additional register. So that makes 17 registers in total... how many more could there be? I have spent at least an hour on this and found numerous different answers. The best answer so far is this, which says that there are 40 registers in total. But if I add that up, I get 48. Could anybody provide an official answer on how many registers an x86_64 CPU has (e.g. an Intel i7). Additionally, I have seen references to 'hardware' and 'architectural' registers. What are those registers and how many are there? Wikipedia has a page about the x86 architecture and all its known registers. Here is a small picture gathering all what we know about it. In fact, not all these registers are officially documented. But, all the registers we know (and we know how to use) are listed in the picture. And, it makes much more than 40. And, I do not know what are these 'hardware' or 'architectural' registers, because for me they are all 'hardware' (not software simulated). 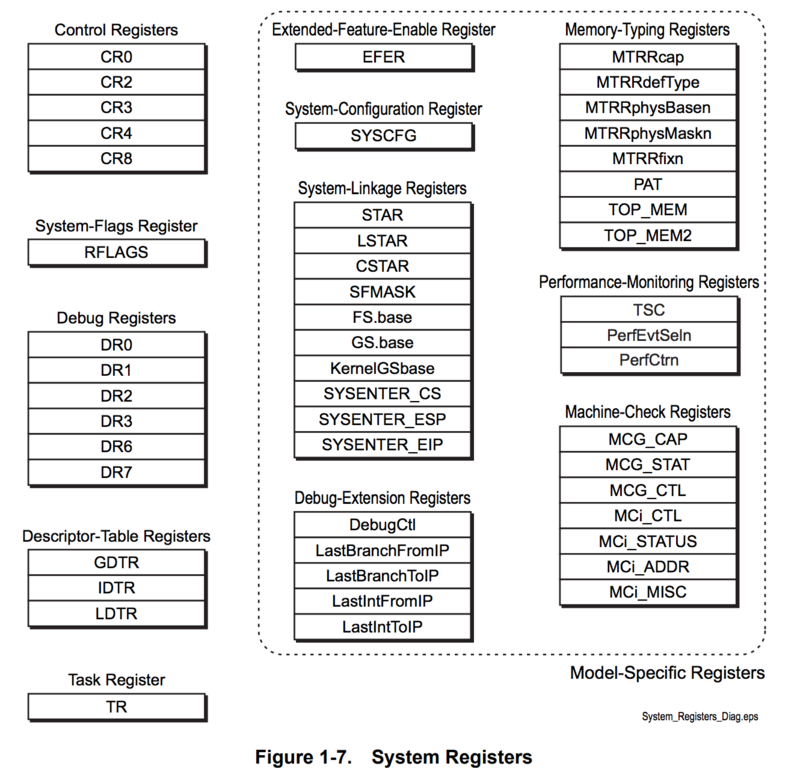 And, what we call a CPU architecture is also including the list of available hardware registers. So, up to my knowledge, they are all both hardware and architectural registers. Note that most of the registers are specialized and have been introduced to support a specific instruction set (the best example are the FPU registers ST0-ST7, introduced to support floating point computation). I believe the discrepancy between 40 and actual sum of 48 is mostly an error, however there are many other registers used for handling hardware, memory management, and control of different features of the CPU. There are, however plenty of less commonly known registers. Those registers are not likely used by user mode programs but used to control and initialize the processor and low-level constructs the CPU is aware of. They control CPU subsystems such as the MMU unit, task scheduling, etc. Documentation of those registers can be found in the AMD64 Architecture Manual. Not in the above picture is the new Extended Control Registers family of registers, for which only XCR0 is currently defined. The System Registers are part of the Model Specific Registers that, as the name implied, are model specific. The variety also changes between CPUs. A full list for the AMD64 architecture can be found in "Appendix A MSR Cross-Reference" of the AMD64 Architecture Manual. 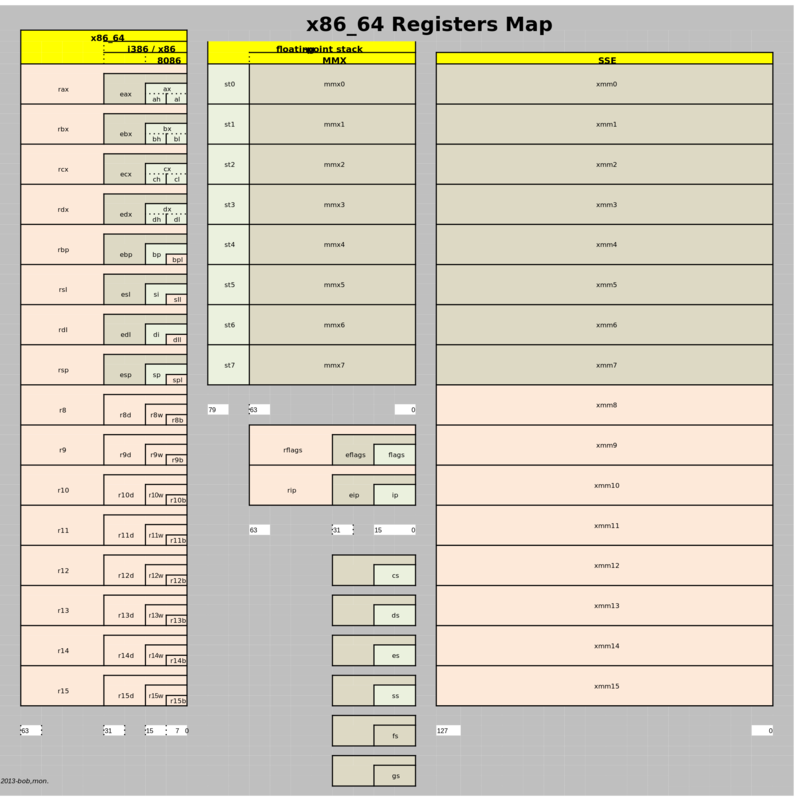 There are extensions that certain AMD64 based CPUs support/implement that extend the set of XMM registers available. The XMM (and later YMM and ZMM) are currently extended to up to 32 registers of 512 bit each in AVX-512. Similar to general registers, XMM registers allow access to the lower parts of their YMM and ZMM counterparts. There are even internal registers that are not exposed through the instruction set but are used for performance reasons. Not the answer you're looking for? Browse other questions tagged assembly register x86-64 or ask your own question.